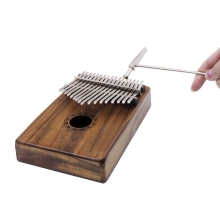 17 key mbira, with really clear and bright sound, easy to play. Exquisite Solid Acacia Wood with metal keys, polished surface. Pocket size allows you practice anytime and anywhere. There may be slightly measuring error due to manual measurement.